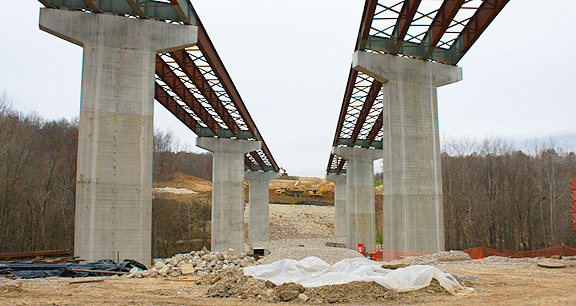 Project obstacles and solutions: The Dry Branch bridge spans a valley on the new I-69 section 4 in Greene County, Indiana. It is a concrete and steel beam construction. The supporting concrete structure includes eight cast-in-place hammerhead piers. Each pier supports four steel beams and the bridge deck. These piers were poured with mass concrete specifications. INDOT requires that the internal concrete temperature not exceed 150 degrees F at any point during the curing process. It also cannot have a variance of more than 50 degrees from core to the exterior concrete temperature. This prevents thermal cracking to occur due to hydration heat. IMI delivered concrete to the site between the temperature range of 40-70 degrees F. The ambient temperature was monitored and the concrete temperature was controlled accordingly. During hot weather, chilled water and ice were used to reduce the concrete temperature during the pour. White Construction monitored the core and exterior temperature as the concrete was curing. INDOT defines mass concrete as any pour that is five feet or more in any of its dimensions. This includes the abutments at both ends of the bridge. In all, IMI supplied 5,200 yards of concrete at mass pour specifications for this project.